The development of the functional processes is inconceivable without the development of the organization and its employees. The organizational performance can be improved through the integrated development of the goals, processes, technology, and the organization. During our consultative works, we often face that the modification and development of the processes, although it is a key factor, is not enough to achieve long-term, sustainable results. Additionally, the development of the organization and the competences of the employees are needed for these long-term results. The efficiency of the employees working in the organization is greatly determined by the environment (goals, responsibility, availability of resources, coopeeration and attitude of colleagues, communication and atmosphere) they work in. The goal of our organizational development programs is to consciously build the foundation of a lasting improvement at the company (at individual, group and organizational level), whose results yield in additional value creation, even after the consultant has left, at the specific field. Determining unequivocal responsibility suited to the processes. Creating ’Ownership’, strengthening commitment and responsibility. Handover and development of the abilities needed for the completion of tasks. Development of the communication and cooperation between concerned parties. Leadership Academy, skills development trainings. Drafting and elaborating vision and strategy. Carreer and succession planning, and talent management program. Design of performance assessment and incentive systems. 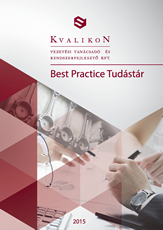 HR – Best Practice survey. Design of Kaizen – suggestion system.